Recently in our Human Genomics group we have been reflecting on the complex problems which can arise when performance metrics of genetic variant effect prediction algorithms used in clinical genomics and research are confounded by circularity and error propagation. Our findings have now been published online: Mahmood, K., Jung, C.H., Philip, G., Georgeson, P., Chung, J., Pope, B. and Park, D.J., 2017. 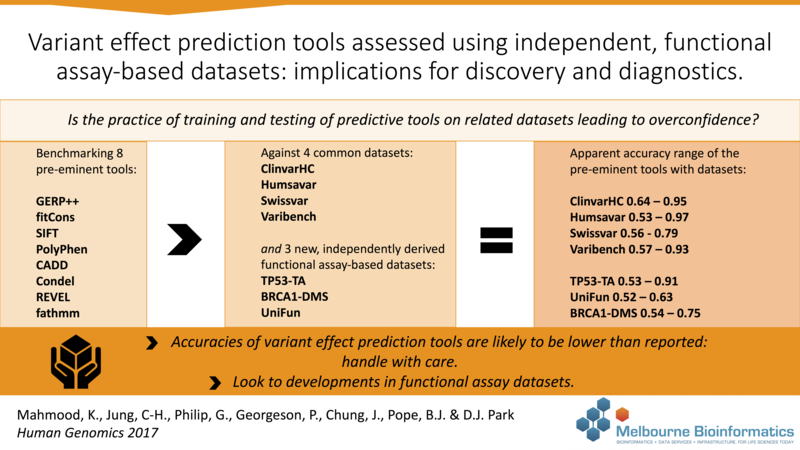 Variant effect prediction tools assessed using independent, functional assay-based datasets: implications for discovery and diagnostics. Human Genomics, 11:10 DOI 10.1186/s40246-017-0104-8. Go to Human Genomics Group web page.